❝Cover it up!❞ Today we are talking about a very important beauty topic which is interesting especially for younger girls, but also adults are suffering from it. I've been dealing with bad acne and blemishes since I'm about eleven or twelve years old so I know exactly what I'm talking about. I tried so many different things in the past to clear up my skin and I have to say that now with twenty one, my skin is a lot better but still not perfect. I will definitely share my tips and tricks on how to get rid of acne and blemishes sometime soon but today we are talking about acne coverage and how to achieve a better skin finish. Let's get #s t a r t e d! First things first. I know how hard it is to get rid of acne and blemishes in general but having a good routine on how to cover it up will help you a lot with your confidence! I still remember how desperate I was 'cause I felt like nobody can help me and the internet was not as it is today, so if I can at least help one single person with this article, it was definitely worth it! If you have oily to combination skin you should definitely try to use a primer for a more matte finish. You'll notice that it's going to be a lot easier to apply the foundation afterwards. A primer will also minimize your pores for a more even finish. Foundation is definitely the most important part about acne coverage and I have to admit that I made a lot of mistake in the past with choosing the right foundation. You have to realize that acne prone skin do needs some special care, special products and you probably can't use whatever product you want. The best tip I can give you is getting a pharmacy foundation. They might not have the biggest range but they do have the best foundations for acne prone skin. I've been getting my foundation at the pharmacy for years and years now and definitely found in the Vichy Dermablend foundation a very good product I swear by. The Artdeco camouflage cream has to be my holy grail product of all time. It will make you speechless, I swear. I can't even tell you enough how much I love (and need) this little guy. I always use it after I apply the foundation to give more coverage to the areas who need it. Camouflage has the highest coverage you'll find out there and can be also used to cover up tattoos. I've been using this powder for the past year and really loving it. 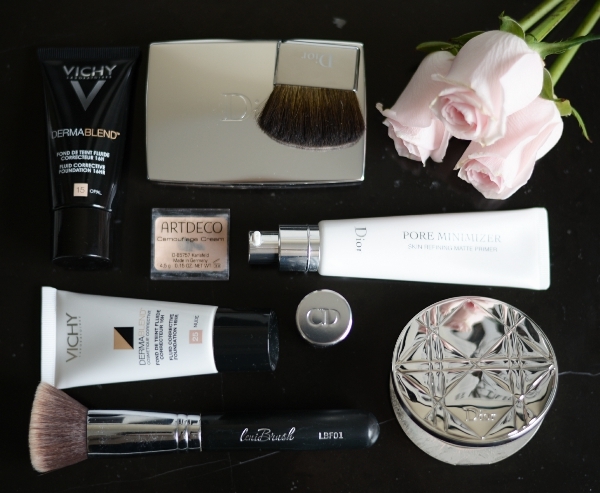 It has the highest coverage from the Dior powder range and really keeps it promises. It comes in a super handy compact box with a sponge and a mirror attached, so you can have it in your purse for touch-ups during the day. I can still remember the time when I first started my foundation routine back when I was like twelve years old and I was always applying it with my fingers. I think I didn't even knew you can actually use brushes for that. A few years ago I found a very inexpensive foundation brush and thought I should give it a try. Well, what can I say... I've been loving and using it ever since! Never switched to another one, only have been using this one. A foundation brush like this will give your foundation a perfect finish and applies it evenly to your face. Such a great post! Thanks for sharing your suggestions. Definitely want to try the Dior Pore minimizer. Love Vichy, and your tips are great :) Bonjour from FRANCE, Sand.